Let us all stop at some point in our busy lives today for a moment of silence. 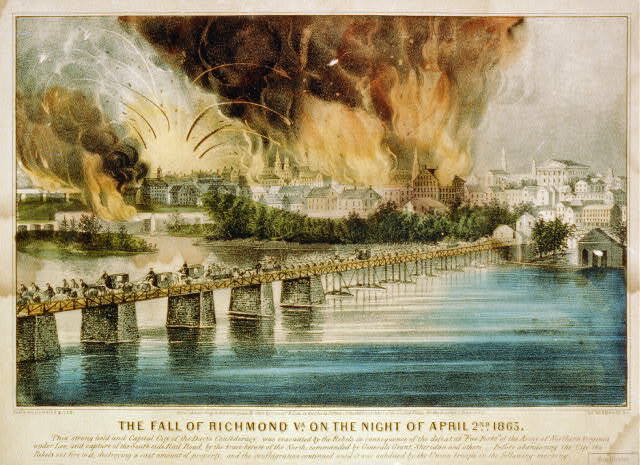 Today, 3 April 2015, marks the 150th anniversary of the fall of Richmond. Lee had always felt constrained by the duty to defend the Confederate capital. But abandoning it, he knew he could move more freely. So when General Philip Sheridan’s troops overran Confederate defenses at Five Forks on Saturday April 1, Lee made the decision to abandon the Petersburg defenses and, in doing so, to abandon Richmond. Confederate President Jefferson Davis had discussed the probability of quitting Richmond with Lee a month earlier, and he had already sent his wife and family out of the city. Despite these precautions, Davis still believed Lee could stave off disaster. I advise that all preparation be made for leaving Richmond tonight. Now The Legal Genealogist is way too much of a Yankee to be mourning the impending end of the Confederacy that the fall of Richmond foretold. My Texas-born-and-bred grandfather referred to this Colorado-born grandchild as a “damnyankee” — one word, of course — for my north-of-the-Mason-Dixon-line attitudes. It’s just that I am too much of a genealogist — and way too much of a descendant of Virginians — not to be mourning what we lost in those fire. The loss of all those records. You see, so many Virginia counties believed their courthouses would be burned by the Yankees as battle after battle was fought on the soil of the Old Dominion. So to preserve and protect the records so near and dear to our genealogical hearts — deed books, will books, court minutes, vital records and more, the counties carefully boxed them up and sent them — for safekeeping — to the city they were sure would never fall. Where, during that terrible 24 hours before the city officially fell to the Yankees, the Confederate Government set some records on fire — and the spread of the fire took out the rest. So let’s have a moment of silence today for the fall of the City of Richmond. And the catastrophic loss of colonial and early statehood records that terrible time, 150 years ago today. Image: “The fall of Richmond Va. on the night of April 2nd” (New York: Currier & Ives, c1865); Prints and Photographs Division, Library of Congress (http://www.loc.gov : accessed 2 Apr 2015).